Chicken biryani is useless unless each grain of rice has intense flavour of chicken in it in my humble opinion. Else the chicken Tahiri is a much better choice for great flavour and soft cooked rice. I prefer soft cooked rice even in biryani but each grain of rice should be separate and firm too, khila khila as we say in Hindi. 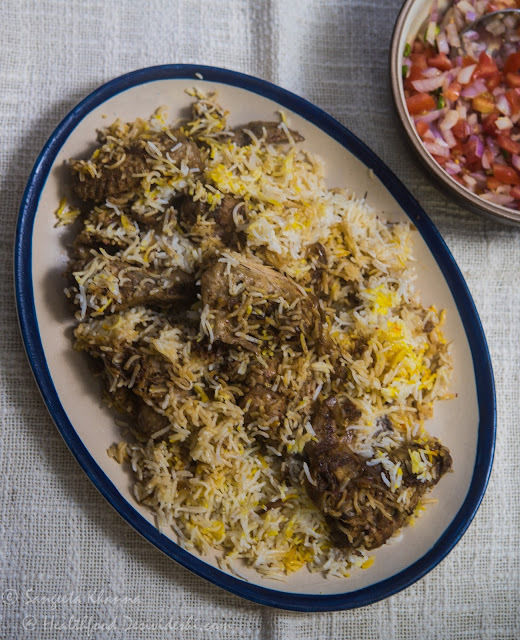 Many biryani makers use parboiled basmati rice for biryani because handling raw long grain rice for biryani is a skill and it breaks or makes lumps if not cooked accurately. Actually cooking even plain boiled rice is a skill that one needs to learn as this is one of the most basic kitchen skill that many ignore. So when all the main dishes are cooked well and the rice turns up either too hard or too mushy, it spoils the whole meal in my opinion. Rice should be cooked well, soft cooked and still each grain separate and khila khila (fluffy) to soak up the flavours of the curry or dal it is served with. All the hotels serve rice which is too dry for my taste and doesn’t really soak up the curry or dal, I skip having rice always when dining out. For biryani the cooking technique of rice becomes even more tricky and of one is cooking biryani in bulk it really needs a methodical approach and a not a casual attitude. Here I will talk about a homestyle biryani where the rice is cooked in yakhni (the meat stock) and the separately cooked meat is added in layers when the rice is cooked half way. This particular chicken biryani is made with chicken wings as I was planning to make chicken soup and we decided for biryani instead, but I love wings with skin so it was not a bad idea. Chicken used for biryani should always be with skin to add more flavour to the rice grains I believe. Also for 200-250 gm rice there should be 500 gm chicken as rice expands almost three times when cooked well. I like adding a few whole peppercorns to this too, you can also add if you like. Rinse the rice, drain water and let it soak for 40 minutes or till the yakhni gets ready. Mix all ingredients for yakhni and cook on very low flame for 40 minutes. Strain the stock and save, retrieve the chicken wings and discard the whole spices. The stock should be 400 ml by now, else reduce it to 400 ml in a thick base handi or pan or add water to make up the volume. Add the soaked rice to boiling yakhni and let it simmer on low heat for 10 minutes. It will take more time if the quantity is more. You are supposed to cook the chicken wings in masala in these 10 minutes. Now heat the ghee, add the ginger garlic paste and bhuno till ghee separates. Now add the cooked chicken wings and toss and let it get pinkish brown slowly. Add all the powder spices, ginger julienne and whole peppercorns if using and cook till the spices get aromatic. Add 1/2 cup water and simmer for 5-8 minutes. Reserve the cooked chicken wings in masala till the rice is half done, almost 10 minutes for this quantity. For this small batch of biryani I just quickly remove half the rice cooking in handi and layer the chicken in masala, cover with the rice taken out, sprinkle with saffron water and seal the pot. For larger quantities you have to be more methodical. Once the pot is sealed with a tight fitting lid or with the help of dough between the margin of pan and the lid, it can be either baked in the oven or can be placed on a griddle on gas stove for dum cooking. The extra layer of griddle at the base of the pan ensures the rice cooks in the lowest possible heat and the aromas mingle well. It needs to cook on dum for 20-25 minutes and then rest off the stove for at least 10 minutes before serving. Serve the biryani hot with some raita or kachumber salad. Turnips are not the favourite vegetable of many people I know, including my husband but there are some people who wait for winters so they can eat turnips. 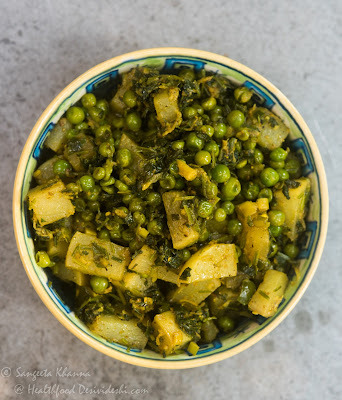 I have got some great feedback about the turnip recipes I have posted here, especially the shalgam alu matar ki subzi and shalgam bhien matar ki subzi that many of my readers have started cooking regularly every season. Bringing you another shalgam matar ki subzi for you today and this one is a unique shalgam subzi that was shared generously by a lady who was buying turnips along with me and I sensed she loves turnips going by the way she was choosing them. The recipe is something I could never have imagined existed, with loads of coriander leaves and a hint of sugar, this turnip subzi has become my favourite now. I have already cooked it three times in three days to get this shalgam matar ki subzi well entrenched into my memory. 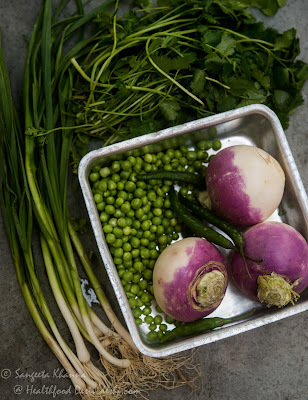 I love the recipe exchange that happens in the weekly vegetable market I visit. Most of the the times it is me who ends up giving recipe suggestions to people when they see me buying unusual vegetables like these turnip leaves for shaljam patta gosht or mongre (rat tailed radish), red cabbages etc. and end up asking how do I cook them. But I have realised that it happens both ways as I always feel free to ask people about how they are planning to cook something they are buying. There are smiles exchanged instantly as a reward and then the recipes just tumble out for our pleasure. This shalgam ki subzi is a typical everyday punjabi recipe that is made without any onion and tomatoes, the lady who shared the recipe told me specifically that she loves this recipe because it is devoid of onion and tomatoes. She just suggested to dump everything together and cook covered till done. 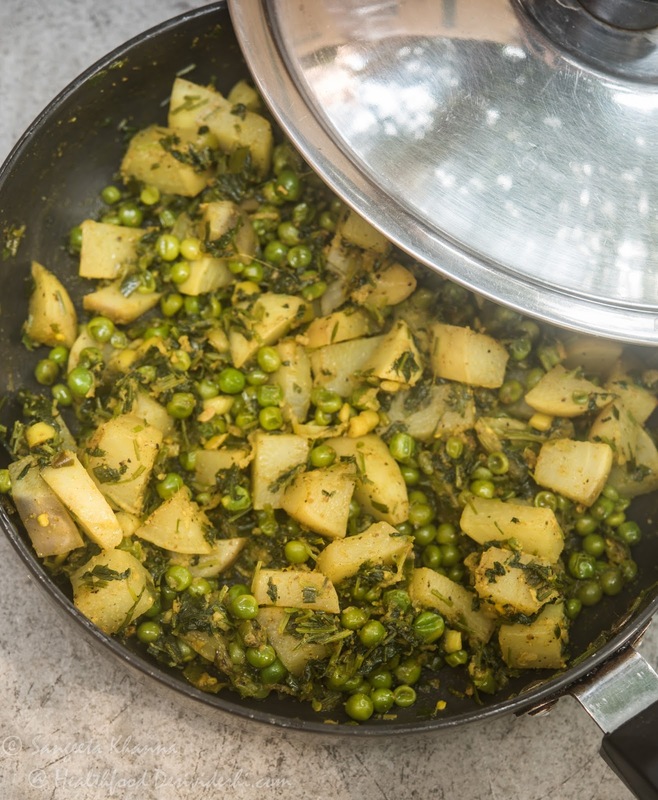 The generous use of dhaniya patta and this quick method was enough to make me try the recipe just as I reached home that day, armed with all the fresh ingredients needed. The only change I made in the recipe is the addition of peas and use of green garlic instead of regular chopped garlic she had suggested, both types of garlic work well I realised after the three trials I did. Clean and cube the turnips. Keep aside. Heat the mustard oil in a pan and tip in the dry spice powders along with the chopped garlic, green chilies and ginger at once. Cook till everything gets aromatic, just about 30 seconds or so. Add the cubed turnips along with peas and chopped dhaniya patta (coriander greens), mix well. The amount of dhaniya patta will feel too much at this stage but don't be alarmed as this is where the taste comes from. Add the salt and sugar, mix well and cook covered at lowest temperature till done. It takes about 8-10 minutes to cook. You can add some water to make a thinner curry and can add a dash of lime juice if you would like a little tartness. 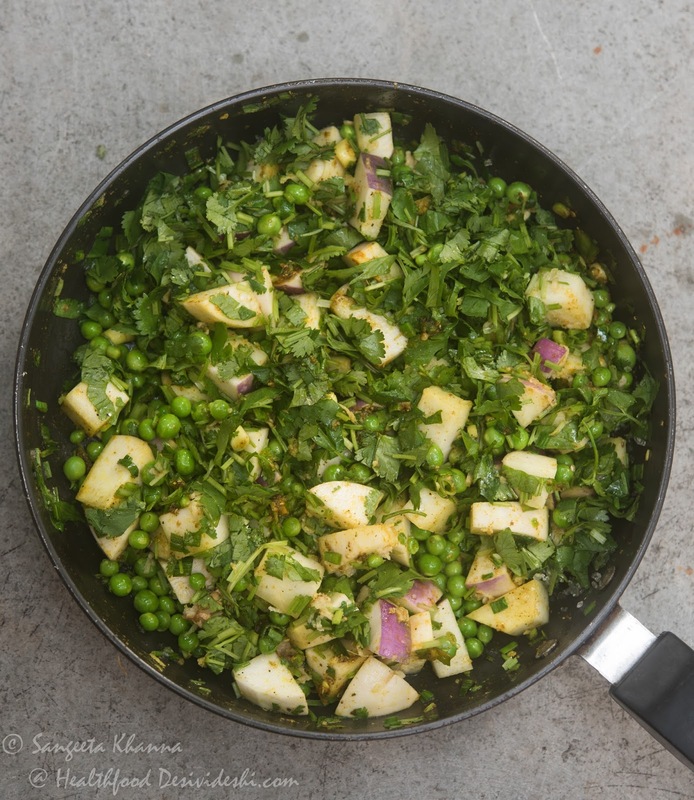 You won't need it if the turnips and peas are fresh because the quality of ingredients is a determining factor in this recipe. This is one of those recipes of turnips that even the turnip haters would approve of, just as the husband did. This subzi pairs well with crisp hot parathas, khameeri rotis, kulchas and plain roti but I think we would love it with khichdi, rice and dal type of meals too. Make this shalgam matar ki subzi now and let me know if you liked it as much as we did.